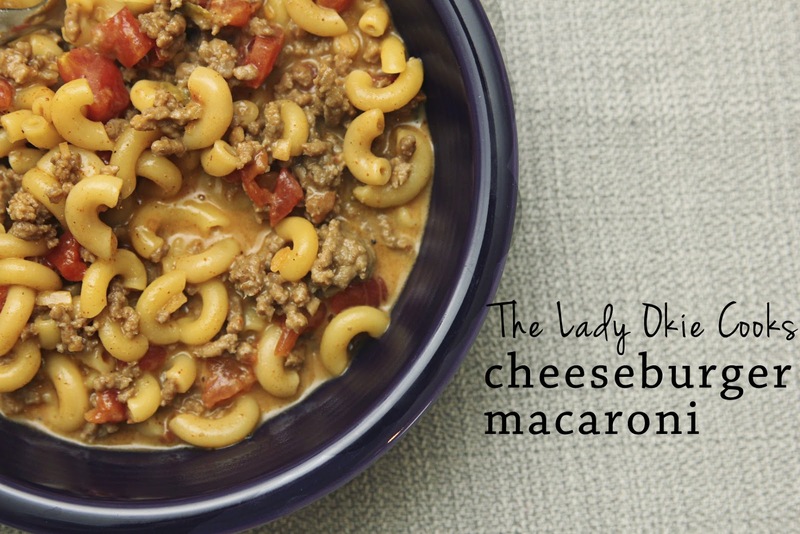 Cheeseburger macaroni is a staple in the Bumgarner house. Seriously. I'd say me make this every other week at least. Why? Well, it's easy to make, I usually have all the ingredients on hand, and it tastes delicious. Before I get into the recipe, I have to give credit where credit is due and let you know that I discovered this amazing recipe here. This is a not a creation a la me. But I can still tell you about it now, right? Right. 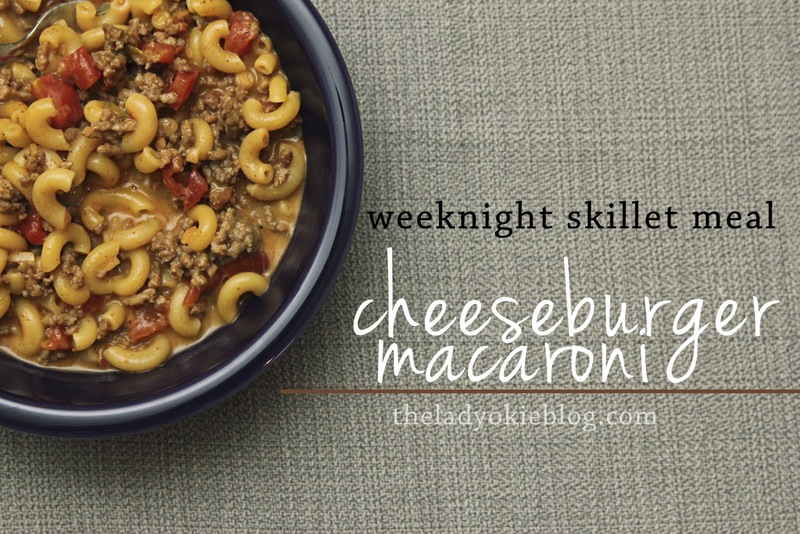 This is a 1 large skillet + 1 small pot meal that takes about 20 minutes to put together, even less if you've already cooked and frozen your ground beef like I told you to do. Tell me you've started doing this, because it saves SO much time. 2) We usually just use water in place of beef broth, and I don't taste much of a difference. >Brown & drain meat in a large skillet. (Or pull out your bag of frozen, cooked meat.) 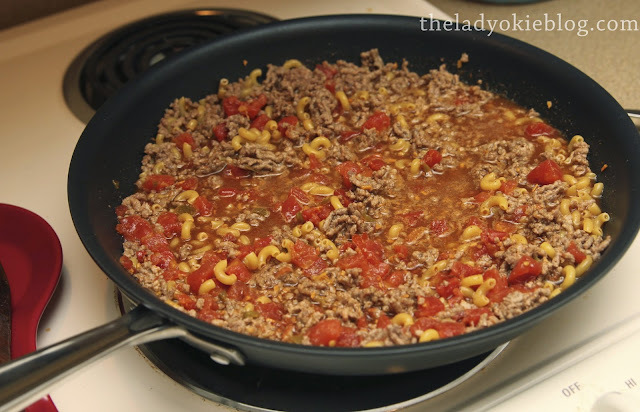 Stir in taco seasoning, Rotel, water/beef broth, and uncooked macaroni. >Reduce heat to low, cover, and simmer for 12-14 minutes, until macaroni is tender. You shouldn't have to stir while it's simmering. 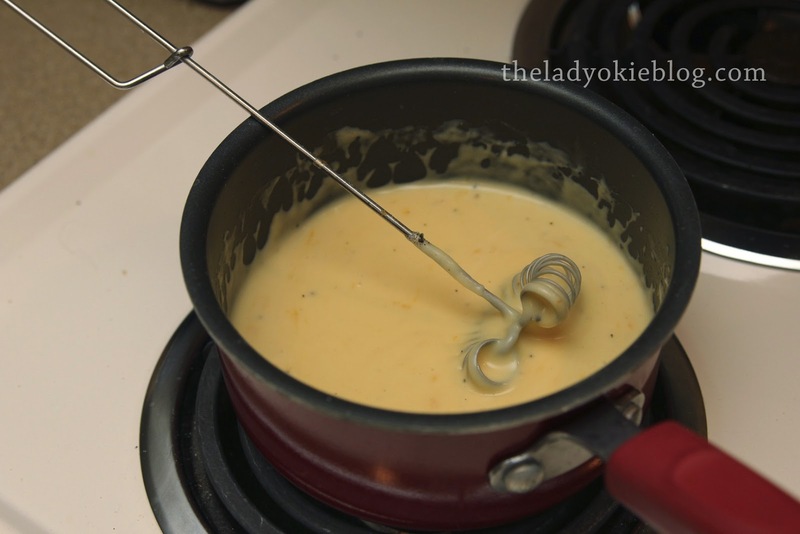 >While the meat & pasta are simmering, make the cheese sauce. *The entire cheese sauce process takes about 5 minutes, so I usually start making the sauce when the meat mixture has been simmering for 8-10 minutes already. >Melt butter in a small saucepan. Whisk in flour until light brown. Whisk in milk and bring to a boil. Continue whisking until the sauce is smooth and thickened, approximately 2 minutes. You'll want to make sure you whisk the whole time or else it will start boiling over. >Remove from heat and stir in shredded cheese until melted. Add salt & pepper. >Pour cheese sauce over hamburger mixture. Stir to combine. Serve. *Note: The Rotel makes this a little spicy, so we like to eat this with Saltines and milk. Follow The Lady Okie on Facebook! This so reminds me of growing up! My Dad made this a lot! Looks yummy! My mom used to make a Hamburger Helper dish that was very similar to this. I bet this one is even better!! I need to try it! Thanks for linking up with Jess and me! goddd my stomach rumbled just looking at this! mouth. watering. I really love your pictures and the recipe looks divine as well.